Kale, Kale, Kale! 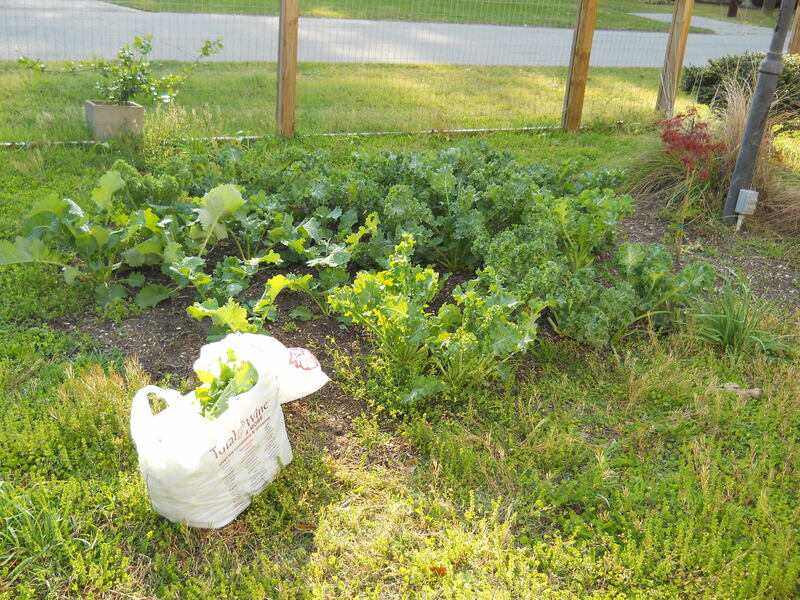 What to do with all my kale? Because food is important for survival, food preservation is one of the oldest techno logies used by human beings. Whether you have an abundance of food from your garden, or would like to have an abundance stored for emergencies- there are many ways to preserve your harvest-from canning, to pickling, to freezing. We have had Kale growing throughout the winter, and it is now thriving as the spring is arriving. We have given it away to our neighbors and friends, we have come up with numerous recipes and become quite inventive with our superfood intake. Recently we invested in a FoodSaver to help preserve our harvest this summer. It has been a great tool for freezing. Ours came with tupperware as well, so we were able to preserve some stews we made this winter. Kale (as well as cabbage and greens) is best preserved by freezing. It can be a little bit of a proceess, but well worth it in the end! 1. Wash & Rinse: Start by washing the kale thoroughly. (We had some bugs and dirt so wanted to make sure to get it really clean) We also like to soak ours for a few hours. I have noticed it helps with the bugs. actions which can cause loss of flavor, color and texture. To do so, you will need two pots (we had a very large harvest so we used our large stew pots) You will need to fill them both with water (enough to cover your kale). The first pot you will need to bring to a boil. The second, you want to fill with ice cubes it needs to be cold water so it will stop the cooking process. 3. 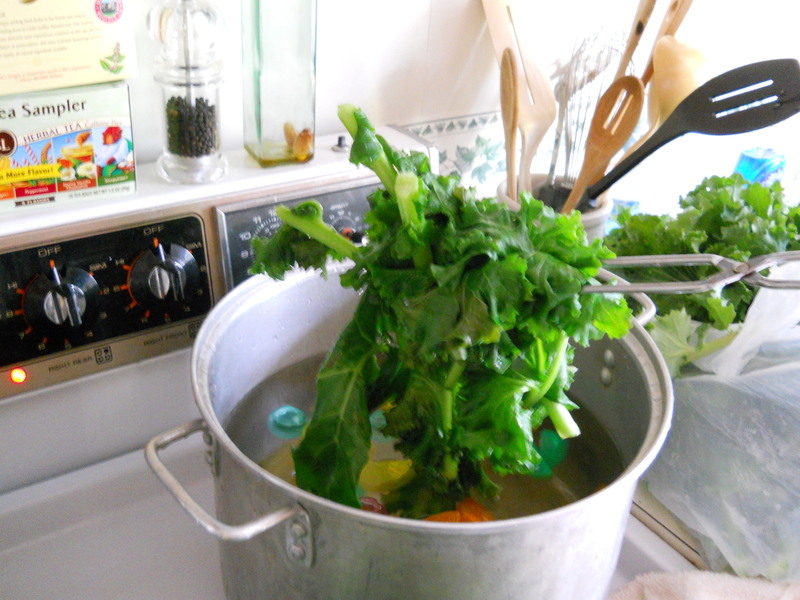 Shock the greens: Immediately remove the kale from the boiling water, and emerge in the ice cold pot. Make sure it is fully submerged and covered and allow to rest in this pot for 3 minutes. The cold water stops the cooking process of the Kale and will allow it to keep its nutrients when freezing. 4. Drain: Remove the kale from the cold water and place in a strainer. 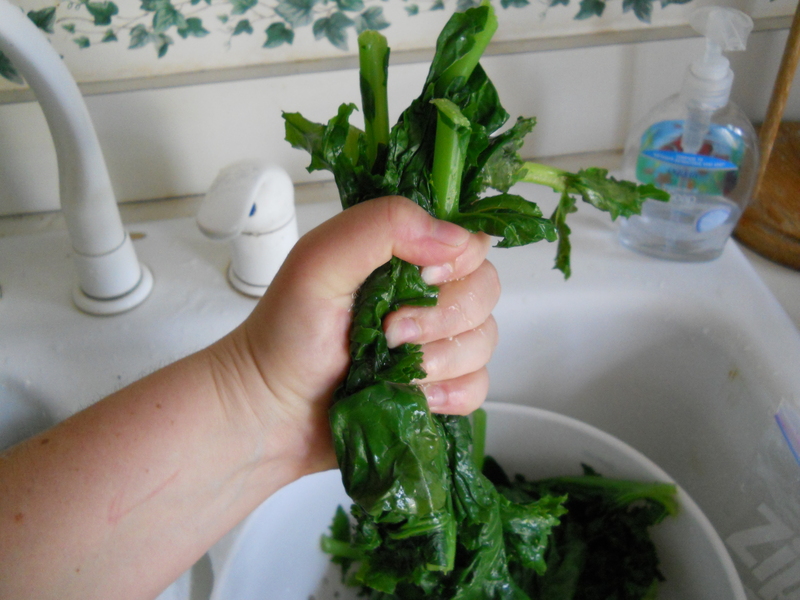 (This is the part I find most difficult) Grab a handful of kale and squeeze as much of the water out of it as possible. 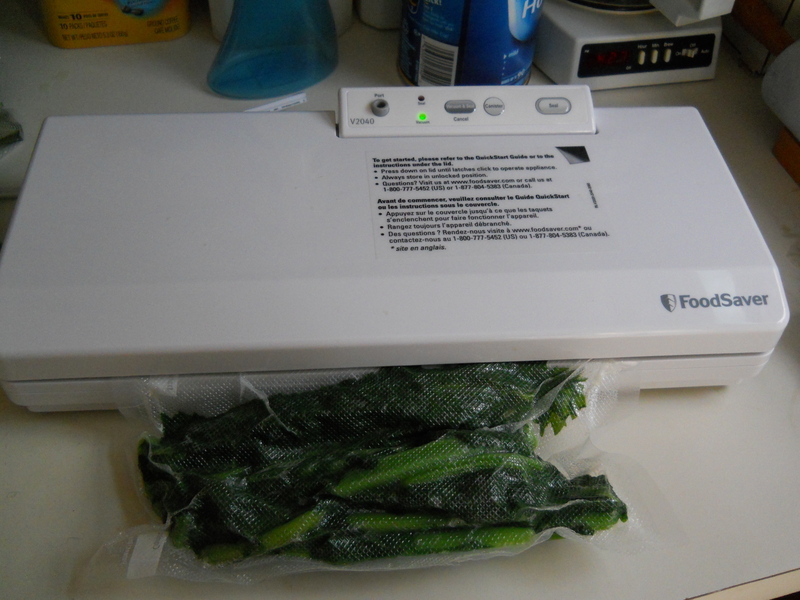 When you use the FoodSaver, you do not want there to be excess water or you will have a hard time sealing the bag. So squeeze your little heart out! 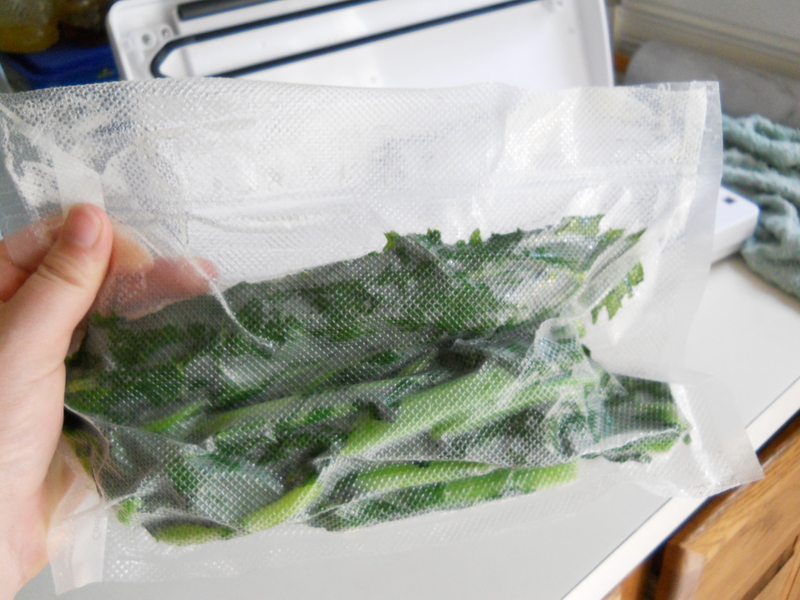 If you are not using a FoodSaver, It is not necessary that you squeeze all the water out, however the more you have in with your greens, the chances of freezer burn are higher. It is also very important that you get as much air out of your freezer bag as possible. Once you have squeeze as much of the water out as physcially possible, place the kale in the FoodSaver bag. I stuff mine full, but still leaving a good amount of space at the top for sealing and allowing the air to be removed. 5. Bag for Freezing: Place your bag so that the opening of the bag rests in the tray (this is where your water will drain into) Press the Vacuum & Seal button and wait for the red light! You will see all the air and some of the juices being sucked out of the bag. If you have a lot of water still in your greens, you may need to do this a few times before it will seal. Wipe clean and try again. Once it is finished, you will have a nice vacuumed sealed bag with your Kale! Make sure to label and date your packages! Greens can be kept frozen for 8 to 12 months. Don’t have enough to freeze and want to use it in more of you meals? Check out some of the ways we use our super-food, it is more than a decoration on our plate!